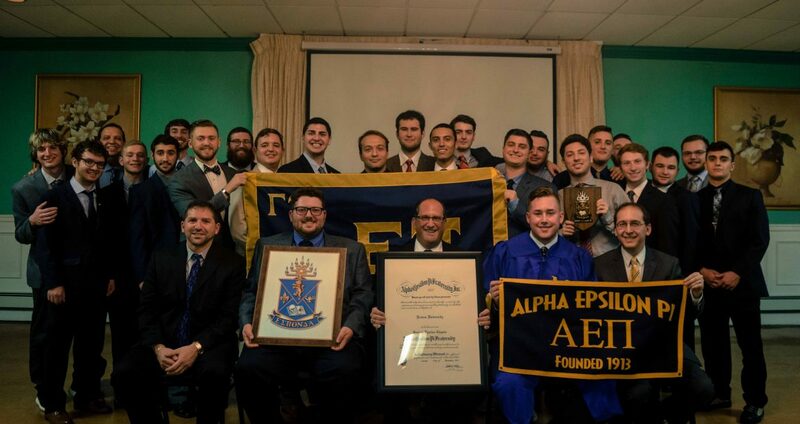 Earlier this month, Alpha Epsilon Pi head its final two chartering ceremonies as the fall semester of the 2017-18 academic year wraps up. On Saturday, Dec. 2, the Gamma Upsilon colony at Rowan University held its chartering ceremony at the Glassboro VFW. The night before the chartering, brothers and alumni came together to share photos and memories from their days as founding fathers to a strong chapter of 19 Jewish men. 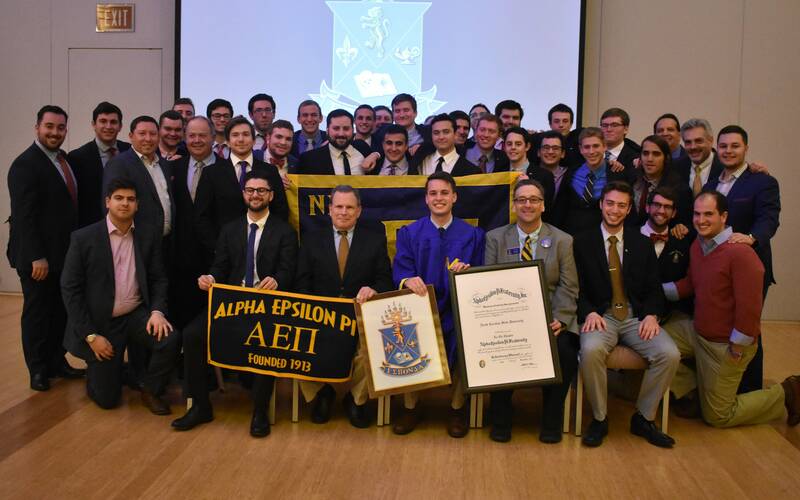 “Everyone joked and reminisced, which showed us how sometimes we need to take a step back to remember the small things that brought us together leading up to bigger memories like our chartering,” said Founding Father Jake Price (Rowan, 2017), who works at AEPi IHQ as a Jewish & Leadership Programming Department Associate. In addition to nearly 60 brothers, family and friends, all seven founding fathers were in attendance. Rowan’s Student Government Association President Lauren Bitzer attended and spoke about how she was proud to be a good friend of the fraternity. Honorary brother and Chabad Rabbi Hersh Loschak helped lead the ceremony invocation and Havdalah service. “It was a surreal moment seeing it all come together. There were moments that were overwhelming, but seeing how proud the brotherhood was put a smile on my face and made me proud to be a part of the chartering process,” said Chartering Chair Austin Soriano (2020). A week later, on Saturday, Dec. 9, the Nu Chi colony at North Carolina State University received its charter at the Talley Student Union. The evening began with dinner and a small Havdalah service. Supreme Master Scott Cohon (Wayne State, 1991) spoke a bit about the chapter’s history and Past Supreme Master A. Edward Scherer (Worcester Polytechnic, 1963) discussed the importance of what the Nu Chi chapter is building at NC State. Associate Director for Fraternity & Sorority Life Christopher Jefferson stood in front of the crowd of 87 brothers, family and guests to express his pleasure of working with the brothers since their founding father class. He wishes more chapters were as true to their values as Nu Chi, who was recognized as the John T. Caldwell Chapter of the Year in October. During the ceremony, brothers ran a raffle and silent auction that raised $1,000 for the chapter and Official Philanthropy Program. Signed memorabilia and merchandise were given to raffle and auction winners. The highlight for brothers was receiving the charter and signing the back of it. Chartering Chair Calvin Newman (2019) found having his father Mark Newman (Duke, 1987) in attendance made the event even more special for him. “Singing Gold & Blue with my dad was amazing. I loved watching all of the hard work come together and having AEPi staff, family and friends with us,” said Brother Newman. Mazel tov to our brothers at Gamma Upsilon and Nu Chi! We look forward to the chartering ceremonies next semester. Check the AEPi calendar for the dates and locations.